"Thirty-five years ago, a group of friends went to a little Italian restaurant south of New Orleans. We all fell in love with their oyster dressing. We ate it so often the guys made a bet to see who could duplicate the recipe. After many tries, one of our friends figured it out and won the bet. During this time I was pregnant with my son and I craved oysters any way but raw. My husband made this for me at least twice a week (35-year-old son came into this world loving oysters). Last year I found the original restaurant recipe in a New Orleans cookbook; our friend hit the nail on the head. This is his version." Preheat oven to 350 degrees F (175 degrees C). Grease a 9x9-inch square baking dish. Melt butter in a large skillet over medium heat, and cook and stir the onion and garlic until the onions are translucent, about 5 minutes. Stir in the parsley, oregano, thyme, salt, black pepper, and cayenne pepper until combined, and gently mix in the oysters. Cook, stirring often, until the edges of the oysters begin to curl, about 8 minutes. 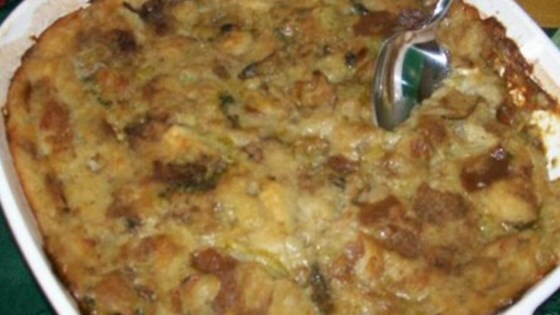 Stir in the bread crumbs and reserved oyster liquid until the stuffing is thoroughly combined. Lightly spoon the stuffing into the prepared baking dish. Sprinkle the stuffing with Parmesan cheese. Bake in the preheated oven until the top is golden brown, 15 to 20 minutes. I have never used this to stuff a bird but have used it as a side dish, or to stuff mirlitons, or as an appetizer with crackers. As we say in South Louisiana, "Laissez les bon temps rouler." This was FANTASTIC!! The only change I made was to half the recipe because not many people in my family like oysters. However, for those who do, this is the best I've had! This is a very good recipe as is. I did add some tony's and maybe a little too much cayenne pepper but it was great. I had it on crackers and loved it.